A 21st Anniversary Gift Bag will be given to all veteran characters who are at least 30 days old logging in between Saturday, September 1, 2018 12:01:00 AM GMT-04:00 (ET) and Sunday, November 18, 2018 11:59:00 AM GMT-05:00 (ET). The Gift Bag will contain an anniversary card and token allowing the selection of a brass orrery or telescope. The telescope also includes a copy of Willebrord the Astronomer’s Primer on Britannian Astronomy. Collectibles available from the “Personal Study” of some of Britannia’s most notable characters, with a rare chance from your character’s personal study! The Orrery can be activated and deactivated by double clicking. The Orrery can be dyed with a metallic dyetub, natural dyes, and promotional dyes. The telescope allows viewing the night sky! Telescopes can be used to view constellations and other celestial objects. Constellations can be charted using the Cartography Mapmaker’s Pen to create a star chart. A star chart can be turned into Willebrord the Astronomer at the Moonglow Telescope Astronomer’s Tent. Players that are the first to discover a constellation will have their discovery logged in the constellation ledger and be given a special title and recipe. Constellation names must be unique when submitting them to Willebrord. All constellations are shard unique. There are 1,000 constellations to discover. Visit the Astronomer’s tent at the Moonglow Telescope to learn more about the origins of Britannian Astronomy and how to use the telescope. Origin, Baja, and Izumo Only – constellations, their associated coordinates, and the constellation ledger have been reset for WW release. Players who submitted constellations will be able keep to the rewards they received. The latest article from the Town Cryer begins the story of this year’s Treasures of Halloween! You must complete this quest to progress through to Caddellite Crafting & Treasures of Halloween. This quest is activated manually on each shard, there will be a delay between publish time and quest activation. Immense power surges through the creatures in Khaldun! From whence it came remains to be discovered, but a means to combat this power has been found! Caddellite raw materials can be obtained via mining, lumberjacking, and fishing. Caddellite raw materials can be harvested in The Lost Lands with special Caddellite infused harvesting tools for sale by an NPC vendor outside Khaldun in Trammel (or Felucca on Siege Perilous). There is a chance to recover a rough meteorite while harvesting. Rough meteorites can be refined into one of several styles of polished meteorites using an oil cloth. Metal weapons can be crafted with Caddellite materials for melee battle against the creatures in Khaldun. Wooden weapons & spellbooks can be crafted with Caddellite materials for melee, ranged and magic battle against the creatures of Khaldun. Caddellite Crafting can only be performed at the Khaldun Camp site. The camp site has a full complement of crafting and adventuring services. During the months of October & November a new terror has befallen the Dungeon Khaldun! Creatures killed in Khaldun have a chance to drop an “Artifact of the Cult.” These artifacts can be turned into the Artifact Trader to redeem rewards. Khal Ankur and the mysterious forces summoning him have established Khaldun as the center of their power. Battle against waves of enemies to claim valuable “Artifacts of the Cult”. Felucca Only – during the duration of the Treasures of Khaldun, 4 of the 6 powerscrolls created will be guaranteed 120 level scrolls. The remaining scrolls have a random chance as they would normally. Scrolls from the Khal Ankur champ spawn will be shard bound and cannot be placed in a scroll book. The 2017 iteration of Treasures of Halloween at the Sorcerer’s Dungeon turn-in vendor will accept Artifacts of Enchanted Origin and continue to dispense rewards until the 2019 iteration of Treasures of Halloween. This vendor will dispense the same rewards it did during the 2017 iteration of the event. The 2018 iteration of Treasures of Halloween at Khaldun turn-in vendor will only accept Artifacts of the Cult that have been received from Khaldun. Both vendors will be removed with the 2019 iteration of Treasures of Halloween when the event is updated. You will no longer be able to carry over points from year to year, and will have 1 year to turn-in/spend any artifacts or turn-in points. Players unfortunate enough to experience death during the months of October & November may find their zombie skeletons terrorizing the cemeteries of Britannia! The Butchers are once again terrorizing cemeteries! New styles of carvable pumpkins and jack o’ lanterns are available! Resolved issue where players couldn’t access all parts of a vault that were located at higher vault positions. Purchasing a vault now provides a receipt which lists the location and next bill date of the purchased vault. The receipt will update once it is past the next bill date after server maintenance. The vault manager now barks the number of objects within the vault to the owner when opening their vault. The warning message when a player claims a vault now provides more information. New designs have been added to the house placement tool and as options house conversion. You can see the winning designs for Publish 101 here and read more about the conversion process here. 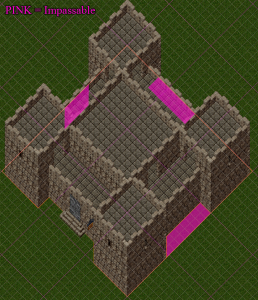 The East, North, and West indentations on the castle footprint are now impassable. The South indentation is still passable. Players will be able to lock items down from inside the house in all these areas (not under the house sign). 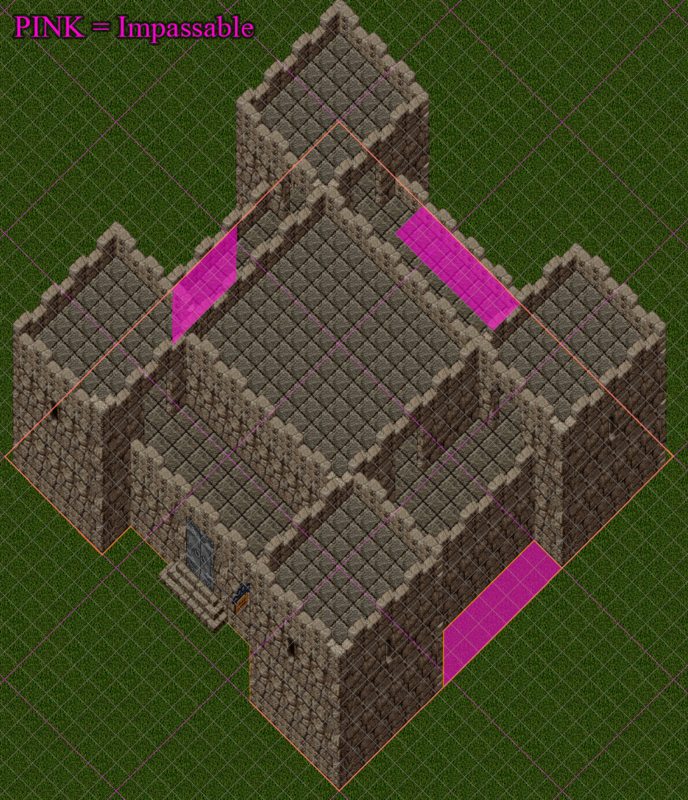 The pink areas are newly impassable areas around the classic Keep. Fixed issue where pet damage done to Anon would not cause him to take the appropriate from when using Elemental Polymorph. Fixed issue where damage from Mage Mastery Death Ray would not cause Anon to take the appropriate form when using Elemental Polymorph. Added options in the Enhanced & Classic client to disable flying animations. Added an option in the Classic client to display large bank and vault gumps. Enhanced Client – Fixed issue with Vendor context menu options not triggering. Classic Client – Fixed issue with crashing when entering house customization. Fixed issue where the “add party” action was available on certain mobs in Khaldun. Fixed issue where the EC bandage macro would not work while bandages were inside the First Aid Belt. Khaldun Tasty Treats will now display duration on the buff icon and no longer send additional system messages when renewing. The first aid belt will no longer be blessed if claimed on Siege. There are now 1,000 constellations to discover. Based on player feedack, the amount of points available from creatures killed in dungeon Khaldun has been increased. This will increase the overall chances at receiving an Artifact of the Cult. Fixed issue where vengeful spirits could chase players outside of Khaldun. Based on player feedback, the Enhance Potions property on the Khal Ankur Mask/Pendant has been set to 35%. Based on player feedback, the hue on the gem bag found in hidden and puzzle chests in Khaldun will match the chest. Fixed issue where resources spawned inside hidden and puzzle chests would not stack with other resources of the same type. Based on player feedback, the first aid belt can now be dyed with specialty pigments and has +2 Hit Point Regen. Mage armor has been added to the Pendant of Khal Ankur artifact. Powerscrolls awarded during the months of October & November at the Khal Ankur champ spawn will be Shard Bound. This applies to the Khal Ankur champ spawn only. Fixed issue where creatures in Khaldun would not attack player when equipping certain items. Decreased the chance for obtaining a rough meteorite from Caddellite harvesting. Fixed issue where Khal Ankur level 4 champ spawn mobs would spawn with erroneously high hit points. A copy of Willebrord’s Astronomy book will now be included when the telescope is claimed through the 21st Anniversary Token. Khal Ankur will now taunt his attackers while under the effects of his guardian generals. Fixed issue where the Constellation Ledger could stop functioning after server up. Only weapons created as “Of the Cult” artifacts will be caddellite infused. Revenants should no longer chase players outside Khaldun. Added taint, dreadmare mane, and corruption to the bag of gems that can spawn inside hidden puzzle chests. Swapped arrows and bolts with invisibility potions that can spawn inside hidden puzzle chests. Increased the likelihood of finding premium rewards in hidden and puzzle chests. Added spellchanneling to Caddellite harvesting tools. Khal Ankur will now change hue when preparing his meteor attack so that players in the EC who filter particles will have warning. Added ability to harvest caddellite ore in Khaldun dungeon. The following issues have been resolved as of the latest TC1 publish – huge thank you to everyone who has taken an early look at Publish 101 and provided amazing feedback! The Orrery can now be used while locked down. This will only apply to newly created Orreries that are claimed via the 21st anniversary token. Willebrord the Astronomer will no longer accept star charts that do not have a name. Blanks can no longer be set as constellation names. The first aid belt can now be dyed with a regular dyetub. An issue where hidden chests in Khaldun would not respawn has been resolved and will no longer erroneously become puzzle boxes. There is now a 100% chance of success when polishing rough meteorites to create a polished meteorite. The drop rate of rough meteorites has been reduced. An issue which caused some puzzleboxes to be unable to be looted has been resolved. The Khal Ankur mask/pendant meteor breath ability will now function against Khaldun creatures. Note caddellite weapons/spellbooks/instruments are still required to damage khaldun creatures. Fixed issue where erroneous tool failure messages would be sent when using the caddellite harvesting tools. Fixed issue where certain areas of the camp crafting area would not function properly. Fixed issue where certain generals would not be attackable during the Khal Ankur fight. Fixed issue where Khaldun tasty treats could not be refreshed while a pet was already under the effect. Khaldun tasty treats now have a different hue when successfully crafted. Customizable Keep & Castle Contest voting has been completed! Keep an eye on UO.com for the final selection of winners from the top 40 chosen by the players! You can read more about the tool and contest here.